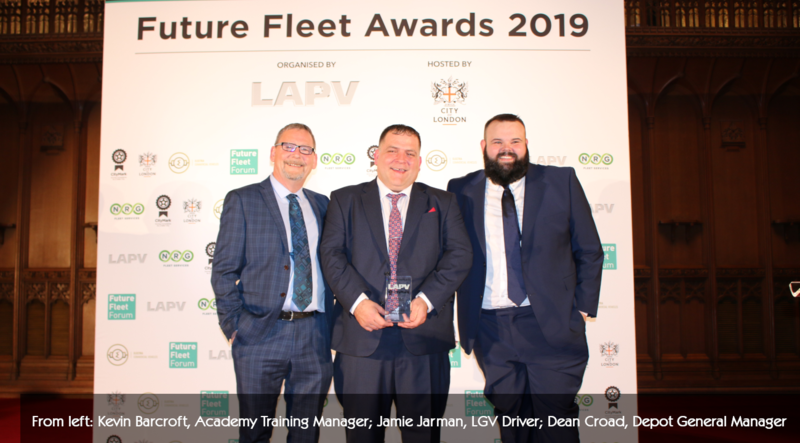 Simply Waste Solutions’ driver Jamie Jarman has been presented with a prestigious award, The City Mark: Driver of the Year, at the 2019 LAPV’s Future Fleet Forum. Jamie has been a Simply Waste LGV driver for nearly 5 years and winning this award is a fantastic testament to the hard work and dedication that he shows in his job. He always ensures that the jobs he’s given are completed to the best of his ability and that the customer is left happy. “I was surprised and honoured to learn that I had been entered in the Future Fleet Awards back in November. Earlier in the year I was delighted to hear that I had been short-listed and invited to attend at none-other than the historical Guild Hall. Now the realisation of what may happen set in; being one of the lucky few to make it into the City Mark Driver of the Year Awards. Then to hear your name called as the winner is still so surreal. City Mark is part of the City of London’s Road Danger Reduction Programme and it’s explained that “This award will go to a driver that demonstrates going ‘above and beyond’ their job. City Mark is looking for a Driver who is a clear role model of safety, customer care, cooperation and integrity”. This recent award is further recognition that we are a company with fantastic training records and are always striving to be top of the waste industry for health and safety.